House Cleaning in London ~ Exclusive 40% Off | Book Today! There is more to life that having a spotlessly clean house to live in, but by having an immaculately clean and tidy home is a very good place to start. It is amazing just what a nice clean home can do for your mood and for your furniture. Remember those old curtains and those have-seen-better-days carpets? They can all look better and can be revived with a good household clean. It is understandable that finding time to complete a good house clean yourself is often harder than it looks and not to mention time consuming too! When you have had a stressful day in your personal life or at work there is nothing better than coming home to a fresh smelling, clean and tidy home and what is even better is that you don’t have to do any of the hard work yourself if you call 020 3397 4918 and have Tidy Up come to clean for you. We are an honest and reliable cleaning company that can offer you many great house cleaning options which will make keeping on top of your household cleaning chores so much easier than ever before! We have had years of experience in cleaning all housed and domestic properties of all varying sizes and now we want to keep your home clean to. Our household cleaning services are guaranteed to save you time, stress, hard work and money too. We know that in order to keep your household and all of the furniture, upholsteries and other items inside it clean too, you may need to spend out large amounts of cash on quality cleaning products and equipments. However, there are two reasons why doing this is still not a firm guarantee that you will have a crystal clean house at the end of it. The first reason is that buying expensive materials, equipments and cleaning agents does not physically get you to do the task yourself. Secondly, many of the cleaning supplies available on the high street and in the supermarkets are not always as good as you think and certainly do not give professional house cleaning companies a run for their money, therefore this option is often simply just a waste of money and time. When it comes to cleaning your house, the best option is to choose a professional cleaning company to do the job properly and efficiently. Time, money, stress, disabilities, health problems, injuries and lack of adequate cleaning supplies are all reasons for why people just like you choose to call our team to have us clean their domestic property for them. All it takes to get your house cleaning issues sorted is to call 020 3397 4918 and we will happily help you by arranging a date and time for your first house clean with our professional cleaning team. 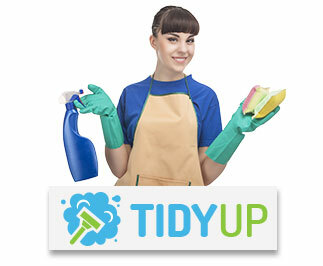 Tidy Up uses various high quality, commercial cleaning supplies and top quality equipment which will leave your home cleaner than you will have ever seen before! If you want to keep a clean home then we have just what you need! If you are selling your property and would like to make sure that it is kept spotless at all times, calling our company today and having our efficient and fast house cleaners clean your property could save you time and win you a sale too!